Why the word "liturgy" instead of "tradition"? In the last post (How to Keep Your Kids From Spending Too Much Time at Church), we considered the specific ways our family's daily habits add up to equal a particular pattern of presence in our culture. The authors we discussed provided several valid descriptors for these chosen patterns: gestures become postures (via Andy Crouch), steps become footprints (that would be my contribution! ), meaningful routines and rituals become liturgies (via James K. A. Smith). We usually limit our idea of liturgy to only the formal, "high-church smells and bells" we've experienced or heard described by others. While a place of worship is the correct context for the term, we should not confuse the style of liturgy with the term itself. Liturgy is the embodiment of our worship -- the way we act out our response of love. I think it's fair to say that like a sacramental life frames for us in the visible world the loving Presence of an invisible God, a liturgical life frames in our visible actions our love for God and each other. This would be a good place to revisit the conversation James K.A. Smith begins in Desiring the Kingdom: Worship, Worldview and Cultural Formation) that we, being creatures created for desire given the freedom from our Creator to order those desires with all sorts of carnal liturgies that do not recognize him (see: mall as consumerist cathedral). I'm not going to take the time now because Brian's written something on a more personal level and I'm excited for you to get to read his words. For now, I'll say that over the next year -- as our family enacts our particular liturgies of worship -- I'll add another post to the series. Mostly, I wanted you to know that I chose the title "Family liturgies" with an intentional hope that you'd feel encouraged you as you form practices of love and worship within your own family. On its own, the word "tradition" does not connote the motive or spirit behind the action. Liturgy -- understood in it's wholeness -- equals action formed of and for loving worship. Our homes a place of worship, our liturgies an expression of love to the Good Father, Son and Holy Spirit. And now, as you read Brian's words, may I remind you how much I love him and how lucky I am to share the journey of parenthood with him? Every year during Advent Tamara and I watch the 1946 classic, It’s a Wonderful Life. 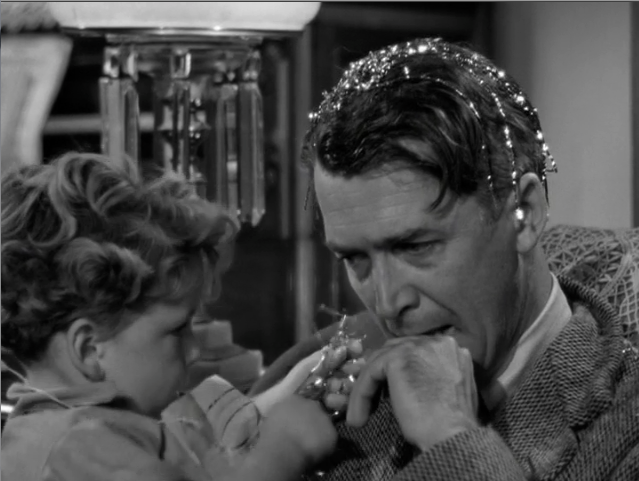 I have a visceral reaction to the part of the movie where George Bailey’s life begins to unravel. It’s right after Uncle Billy inadvertently hands the villain, Mr. Potter, eight thousand dollars that belong to the family business. On Christmas Eve George returns to his loving home to find the family busily preparing for the big day. It is chaos. The four kids are being, well… kids –- asking questions, playing piano, running fevers, George is stressed, the cops are coming and all hope is lost. I cringe because I am George Bailey, or I was anyway. It’s not often that our worst moments get caught on film as a lasting monument to our pride. I am lucky enough to have two such monuments: wedding pictures with me sporting a mullet and a video of Christmas 1997. Tamara’s family was on mission in Korea and we were determined to keep every family tradition with our four kids in front of the mounted video camera to send to Asia. One family tradition is to read the Christmas story from Luke 2 while the kids bring each character of the nativity to the stable at the appropriate time. In our twenty-seven-year-old-parental-wisdom we decided to keep this beloved family tradition using the hand-painted ceramic nativity set that we received for a wedding gift and that we hope is used well after Tamara and I are gone. Four kids, ages 6, 4, 1 and 17 days, a priceless ceramic nativity, a stressed out dad and a video camera. I scolded, growled and snatched Baby Jesus out of the hands of an innocent child. At one point during the morning, I threatened to cancel Christmas. Yep, Christmas cancelled on account of kids being kids. I was George Bailey. I make jokes about the mullet – “ceremony up front and wedding reception in the back”. I’ve made rules about the video. No showing to anyone but family. No watching it when I am around. No taking it out of the house. I was not a very good dad when my kids were young. I was selfish. 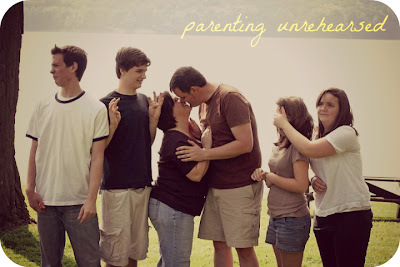 I wanted to have perfect kids so people thought I was perfect. My heart was not for my children. My heart was for me. Somehow we as parents need to imagine the kind of people that we want our kids to be and work to raise that kind of person. Easier said than done, right? I want my kids to be human. I want them to be kind, helpful, faithful, funny, emotional, expressive and real. I don’t want them to take themselves too seriously, be afraid to fail or be perfect. Christmas morning 1997 was a turning point for me as a father. I did not like what I saw on the video. I still don’t. Tamara and I began to read and pray. We talked to friends and family whom we wanted to model as parents and respectfully ignored those we didn’t. I sought counseling and emotional healing. I confessed my sin, shame and fatherlessness to God. When our kids were old enough, I asked them to forgive me for that Christmas and other days like it. They did. Our kids are now 21, 19, 16 and 15. They’re not perfect, but they are human. And we never did break that nativity. Lucky. 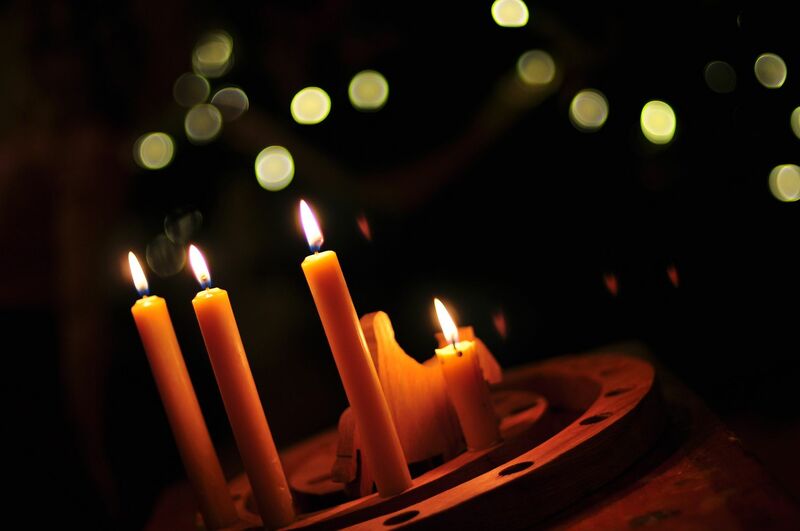 If you've ever considered following the ancient rhythms of the liturgical calendar there's no better time to start than at the Church's New Year: Advent. Even if your church follows the civic calendar more prominently than the liturgical, you can follow along with your brothers and sisters in Christ across the globe from the quiet spaces of your own home. You could create -- figuratively or, even, literally -- a family altar in your own home. This does not have to be elaborate, time-consuming or expensive. Simple tangible acts will impress themselves upon your hearts and minds as well as your children's for a lifetime: a book or two filled with rich images and time-tested writings, mealtime prayers, a candle or two. 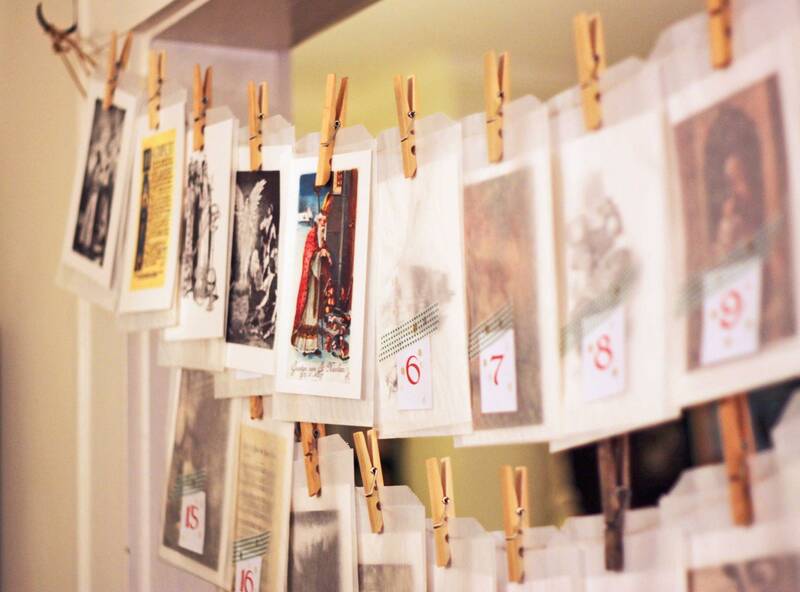 To read through my own coming-to-Advent journey over the past four years, click here. Simply put: waiting helps us to grow up. Waiting forms us into a people who are more attentive to our own needs and the needs of others. Waiting strengthens all sorts of character development. Waiting connects us to the saints of all time who waited for Jesus -- first before He came as a Baby and now before He comes as a reigning King. Waiting helps us hope in God. We try to listen to music, occasionally look at the stars together, dream about the feasting we'll enjoy at Christmas, anticipate the fun we'll have giving and receiving gifts. We also pray for and cheer each other on as each of us works to finish all the projects, deadlines and assignments that come with the end of the semester and calendar year. This can be stressful so we encourage quiet naps, hot cocoa and old movies to enjoy together. Once in awhile, we even get crafty and make homemade gifts to give when Christmas comes. Sometimes we just enjoy the ideas of making homemade gifts someday. The point is we try to avoid crazy traffic, crazy stores and crazy commercials during Advent (really all year, but especially at Advent!). There's no better practice to give to Jesus at Christmastime than to serve the hungry, lonely, poor and sick. This looks a little bit different every year but our hope is that during the four weeks of Advent we will have collectively served others with our time, energy and money. Sometimes we do this in secret, other times we join with others in a larger serving event. You know better what types of local projects are needed in your area (I'd love to hear about them in the comments below!) May I encourage you to think creatively and give not just money but face-to-face presence as well? My mother always invited neighbors she knew did not have family to visit them for a beautiful Christmas dinner during December. These are beautiful memories for me. As far as I can tell, the family practice of lighting candles and reading Scripture together is most often celebrated every Sunday in Advent. We tend to go overboard a bit around here but it's working for us! Best tip for you if your family feels awkward doing this: Turn the lights off! Advent is about waiting for light anyway so it fits. There's nothing like sitting in the dark looking a few flickering candles to break the ice of awkward family Bible time! If it may be of help to you, I've included a list of favorite resources our family has used the past several years. Before you read further, let me assure you if this sounds all holy and somber that is not exactly true to life. If you know us in real life, you've already figured that out. Take for example, the plastic zebra and the 'I heart Bingo' sign that showed up on last year's wreath. It's a long story, but I'm blaming Chesterton's influence for that one. Advent and Christmas Wisdom from G.K. Chesterton: This is the reader we used in 2011; it was an excellent choice for our kids' ages! Advent Activities to coordinate with the Chesterton reader: The Advent activities I put together for Advent 2011 when our family used G.K. Chesterton's marvelous -- and witty -- wisdom. Devotions for Advent (Mosaic Bible): We have both the Bible and the handy Advent and Lent devotional booklets. The readings are the same, but the small booklet is great for carrying in a purse or sharing with a friend or family member. The booklet is only $1.99 and includes the same full color artwork as the Mosaic Bible. Wonderful resource for a family, small group, Sunday School class, or an entire church community. The Cradle to Cross Wreath handmade from the Voskamp family. All proceeds go to Compassion International. The Cradle to the Cross Wreath: I've mentioned before how much we've enjoyed using this wreath for our Advent, Lent and Pentecost celebrations. You can go to Ann Voskamp's site to see how her family uses the wreathe for Advent. We have enjoyed it so much, but also do recommend using dripless candles! I'm not sure how many orders they've received and whether you'd be able to get yours in time for the beginning of Advent, but I encourage you to order it anyway. Worst case, you'll be all prepared for Lent 2012! Click here to visit a site with all sorts of Advent information and resources. 5. We sing this song. A lot. Blessed Advent to you and yours! I love to hear from you! For example, what are some ways you've both learned and taught healthy practices of waiting and Advent? Also, please feel free to share the sorts of questions you've been asking about parenting.